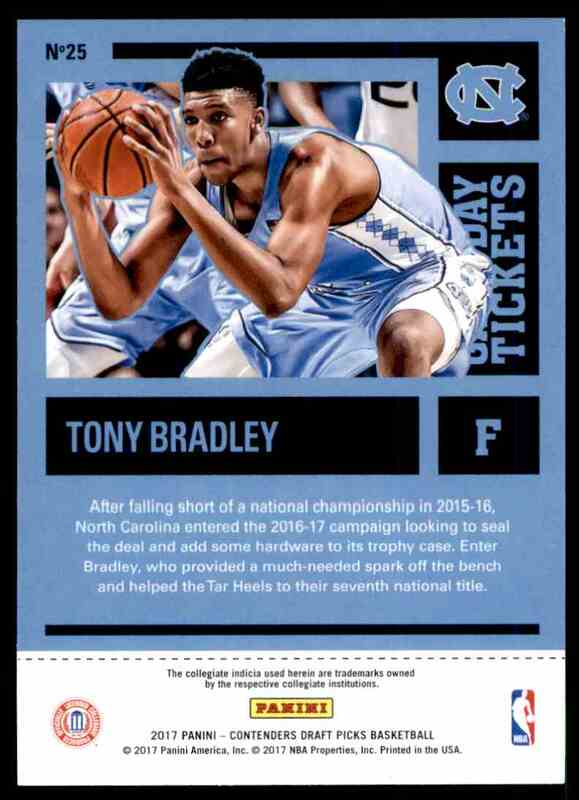 This is a Basketball trading card of Tony Bradley, North Carolina. 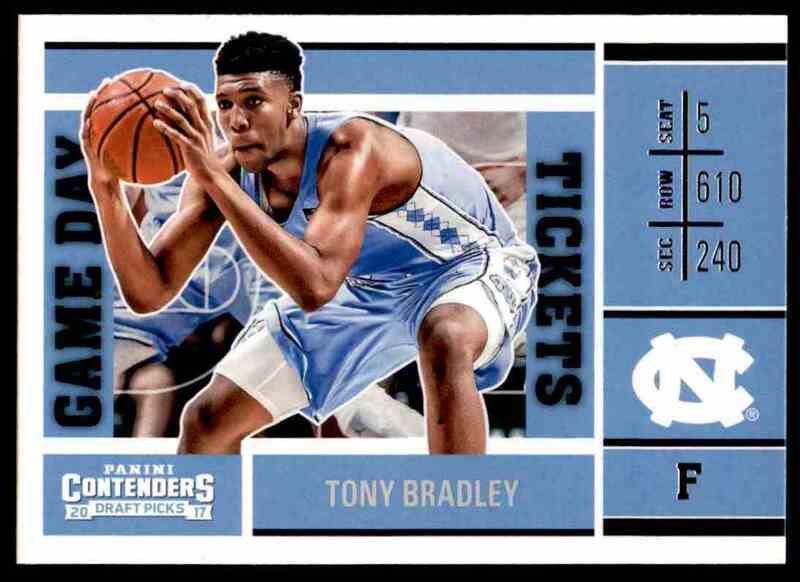 It comes from the 2017-18 Panini Contenders Draft Picks set, card number 25. Game Day Tickets. It is for sale at a price of $ .99. PayPal and Credit Cards thru PayPal. Returns accepted within 14 days. Buyer pays the shipping. After receiving the item/s, contact seller within 14 days. Refund will be given as money back after the returned item/s are received. Buyer pays for return shipping. No restocking fees. Returns must be in the same condition as delivered. Any unopened or sealed item/s must be returned that way. Thank you for visiting Dawghouse Sports Cards. I have Baseball, Basketball, Football, Hockey, NASCAR, and other sports and non-sports cards. All my cards come from a smoke free home and are in Excellent-Mint condition unless otherwise noted. Please contact me with any questions you have on the card/s that I have listed. Always willing to listen to offers. I combine shipping. Each additional single card on the same invoice ships for free. Shipping is a Flat Rate $3.50 USPS First Class Package with Tracking anywhere in the USA, I ship 1-3 business days after receiving payment. Your card/s will be securely shipped to you in a Card Sleeve and Top Loader (unless otherwise noted). Mailed in a padded bubble envelope or small box depending on the number of card/s. International buyers please note: Import Duties, Taxes and other charges are not included in the item price and shipping cost. These charges are the buyers responsibility. I will be adding more cards so be sure to check back on a regular basis.